Set aside ½ cup of the salsa, ½ cup of the cheese, and ½ cup of the sour cream, for garnishing the nachos. In the bottom of a 110-oz. tin can or a tall bowl, spread a thin layer of cheese dip. Using a ¼ of the nacho chips, make an even nacho chip layer over the cheese dip. Top with ⅓ of the remaining cheese sauce, ⅓ of the cooked chili, ⅓ of the black olives, ⅓ of the remaining shredded cheese, ⅓ of the remaining salsa, and ⅓ of the remaining sour cream. Drizzle with hot sauce. Repeat layering the chips, cheese sauce, chili, black olives, shredded cheese, salsa, sour cream, and hot sauce two more times. Layer the remaining nacho chips on top. 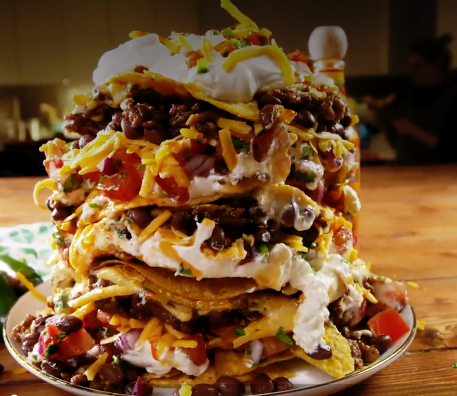 Place a very large dinner plate on top of the can and carefully flip over and slowly remove the tin from the nachos, leaving a nacho tower behind. Top the nacho tower with the reserved sour cream, shredded cheese, and salsa. Drizzle with hot sauce before serving. In a greased 6-qt. electric pressure cooker (I use coconut oil), place the cream cheese, sour cream, mustard, garlic powder and beer. Lock lid; make sure vent is closed. Select manual setting; adjust pressure to high, and set time for 5 minutes. When finished cooking, quick-release pressure. Stir with a whisk until well combined. Select the sauté setting, and adjust for normal heat. Stir in cheese and heavy cream. Cook and stir until mixture has thickened, 3-4 minutes. Transfer to serving dish. Sprinkle with onion and crumbled bacon. Serve with chips or on nachos. Yield: 4-1/2 cups. In a greased 3-qt. 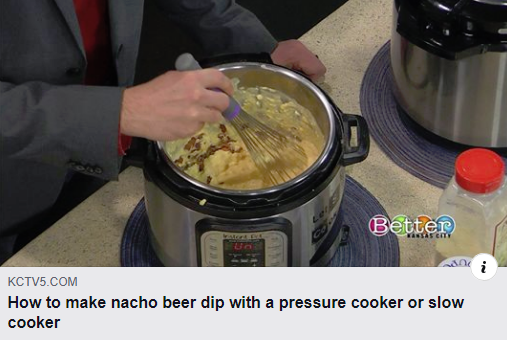 slow cooker, combine cream cheese, sour cream, mustard, garlic powder, beer and cheese. Cook, covered, on low, stirring occasionally, until heated through, 3-4 hours. In last 30 minutes, stir in half and half and bacon, reserving two tablespoons. Top with onion and remaining bacon. Heat up your Instant Pot - Press the Sauté button and press the Adjust to enter the ‘More” Sauté function. Wait until your Instant Pot reads HOT. Brown the Ground Beef: Add 1 Tablespoon olive oil in pressure cooker. Ensure to coat the oil over whole bottom of the pot. Add ground beef and pork. Generously season with kosher salt and freshly ground black pepper. The ground beef will start to release moisture. At the 5­ minute mark, remove the ground beef juice and reserve it in a small mixing bowl. Allow the ground beef to brown. Stir occasionally until slightly crisped and browned (about 5 – 7 minutes). Taste and adjust the seasoning with more kosher salt and ground black pepper if needed. Remove the ground beef, pork and the rest of the juices from the Instant Pot and set aside. Mix the Chicken Stock Mixture: While the ground beef is browning, mix 1 cup unsalted chicken stock, 2 Tablespoons of fish sauce, 1 Tablespoon of light soy sauce, 3 Tablespoons of tomato paste, and 1 teaspoon of unsweetened cocoa powder in a small bowl. Sauté Onion, Garlic and Spices: Heat up the remaining Tablespoon of olive oil. Add diced onions, and season with salt. Sauté for about 5 minutes until the spices start to release their fragrance. Stir frequently. Add the minced garlic, cumin, chili powder and oregano. Cook until fragrant (about 1 to 2 minutes). Now we want to deglaze the Instant Pot, to scrape up all of flavorful bits called fond. Pour in ½ cup of the Umami Chicken Stock Mixture, fully deglaze the bottom of the pot by scrubbing all the brown bits with a wooden spoon. Mix the brown bits with the stock mixture. Pressure Cook the Chili: Add in the reserved beef, pork and juices (from above). Pour in the remaining Umami Chicken Stock Mixture. Add 2 cans of drained red kidney beans (unless making ahead, and then omit until ready to warm up). Mix well. Pour in 1 can of crushed tomatoes with all the juice on top. Do not mix. Close lid and pressure cook at High Pressure for 10 minutes + Natural Release. Open the lid carefully. Reduce and Season: If the chili is too runny, give it a quick stir and cook for another few minutes over medium heat (Instant Pot: Press Sauté button). Taste and season with brown sugar (start with 1 Tablespoon), kosher salt and black pepper. You can also take a break here and refrigerate the chili for several hours or overnight before finishing. Add the beans when reheating the chili. Serve: Garnish chili with optional ingredients. Serve over your favorite side dishes. Notes: You can adjust the amount of chili powder depending on your own personal preference. Slow Cooker: Follow all of the steps above using a frying pan. When you get to the Pressure cook step: Add the ingredients to a slow cooker and cook on Low for 4 to 5 hours or on High for 3 to 4 hours. Prepare the brine mixture and stir until completely dissolved. Place the ribs in a one gallon zip lock bag and add the brine mixture. Place the bag in a bowl (just in case there are any leaks). Let the ribs soak in the in the brine mixture and refrigerate for one to three hours. When ready, remove and pat dry. Season the Baby Back Ribs with the kosher salt and pepper (front and back). Let sit for 10 to 20 minutes. Place 1 cup of water and the trivet in the pressure cooker. Place the baby back ribs on top of the trivet. Close lid and pressure cook at High Pressure for 16 – 23 minutes. Adjust the timing according to your preference: 16 minutes (Tender with a bit of chew) to 23 minutes (Fall off the bone). Turn off the heat and full Natural Release. Open the lid carefully. While the ribs are cooking in the pressure cooker, preheat the oven to 450F. Apply Sauce and Finish in the Oven: Line a rimmed pan with foil and place a cooling rack on top. Place the ribs on the rack and then brush your favorite BBQ sauce all over the ribs (all sides including the bones). Then lightly sprinkle with your favorite BBQ rub on top. Place the pan with the ribs in the preheated oven for 10 – 15 minutes. NOTE: You can also use St. Louis cut ribs for this recipe. Just increase your time to 30 minutes. Brine and salt ribs. Add ¾ cups of water and ½ cup of bbq sauce to the bottom of the slow cooker. Place the ribs on top. Cook 4 to 5 hours on low or 6 to 8 hours on high. Finish in the oven (see above). Turkey on the grill. Great flavor and lots of fun. This is my favorite way to cook a turkey for any occasion. Succulent flavorful turkey along with one of the best gravy that I've ever had. All shown in an easy "step by step" guide from Weber grills. Brush the oil on the pineapple rings and carrots (season carrots with 1/8 tsp of kosher salt). Cook the carrots and pineapple over direct medium heat until tender (8 minutes for the pineapple and 16 minutes for the carrots) turning once. Cut the carrots and pineapple into ½” pieces. Combine the carrots, pineapple, and Glaze in an aluminum pan and cook over direct medium heat until the glaze thickens (about 10 minutes). Salt and pepper to taste. Mix the stuffing, stock, olive oil and butter in an aluminum pan and place on an *indirect medium hot grill over the "cooler" side of the grill. Add a chuck of apple or hickory for the smoke source. Heat for 10 minutes or until the water is thoroughly absorbed and the stuffing is heated. Off heat, stir in the apples, zest and nuts. Salt and pepper to taste. *Indirect – heat source on one side, food on the other. For charcoal grills, place all of the charcoals on one side of the grill creating a hot side and a cooler side. For gas grills, turn one side on and put the food on the other.